Tiger stripes are individually as unique as human fingerprints. Tigers are widely distributed from the alpine Himalayas to the rain forests of southern Western Ghats and from the dry forests of Rajasthan to the moist forests of north-east India. The tiger is a powerful icon of India’s cultural and natural heritage, and its survival has been a top priority for WWF-India since it was founded. WWF-India’s efforts to save the tiger began in the early 1970s with the vital support it provided towards Project Tiger – the first-ever tiger conservation programme launched by the Government of India in 1973. In the early 1990s, WWF-India initiated a focused Tiger Conservation Programme, and since then has been working with state forest departments, local communities and other stakeholders addressing key conservation issues in different tiger landscapes. The tiger is one of the largest and most awesome predators in the world. This species undoubtedly fascinates every eye it meets. The body length of the majestic male ranges from 275-290 cm and of the female around 260 cm. The size and colour vary according to the geographic location and climate. 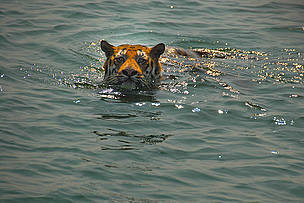 Tiger is solitary and territorial and the territory of an adult male may encompass territories of two to seven females. It is carnivorous and hunts for prey primarily by sight and sound. It feeds on deer, wild pig, bovid and sometimes even other predators like leopards and bears.